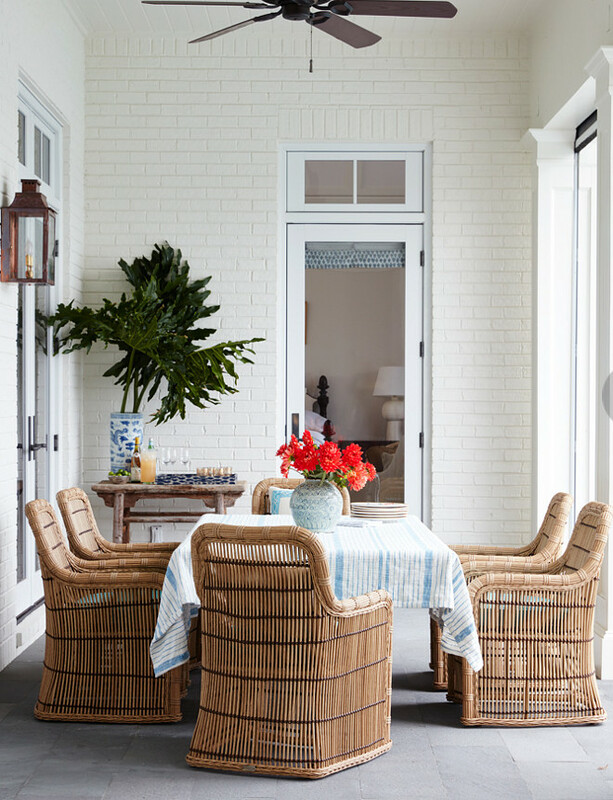 Located in Florida and currently being featured on the pages of Cottages and Bungalows magazine, this classic shingle style home features interiors that are effortlessly chic. 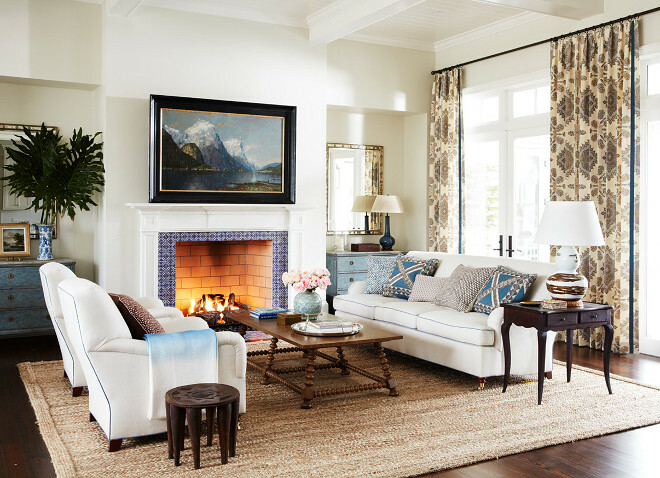 With a timeless coastal flair, the acclaimed interior designer Andrew Howard from Andrew Howard Interior Design created a home that certainly will stand the test of the time. How? 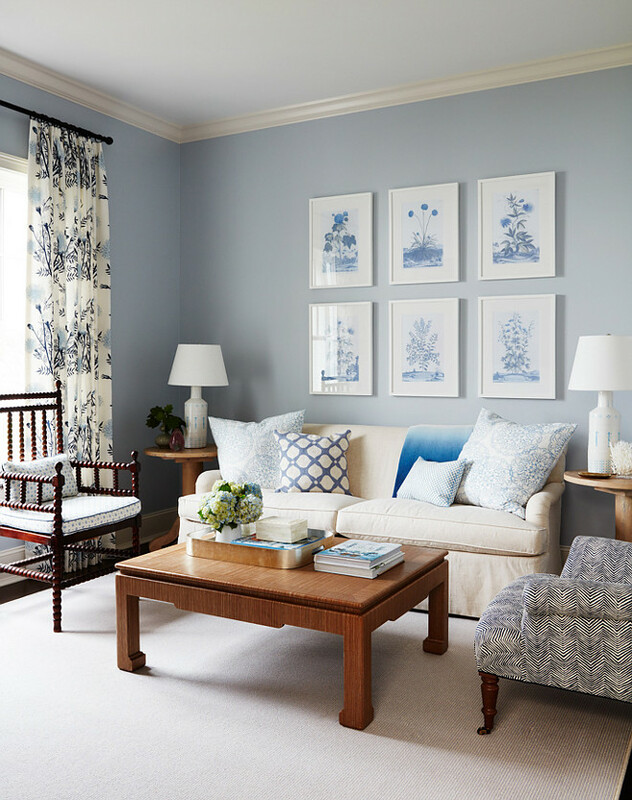 He effortlessly incorporated classic furniture pieces with classic colors like blue and white while using some surprising elements that are sure to grab your attention. And who are we to argue with that?! Take a look and you will see that this home truly feels comfortable, classic and truly inviting. Beauty never looked so approachable! The living room of this home feels collected yet approachable. Who wouldn’t love to sit by that roaring fireplace? The blue and white fireplace tile is from Mosaic House. Paint Color is “Benjamin Moore OC-139 Sea Wind”. Combining Colors: “One thing I love about blue is it pairs so naturally with just about any color. We went with fabrics that we liked and then built schemes and rooms around them. I don’t think there was a conscious moment where we said that we wanted a certain color to pair with blue it just naturally evolved as we found things we liked. I think that’s important because that’s really how I wanted the home to feel… Something that evolved over time versus something a decorator dropped off over the course of a 2 day installation”. – Andrew Howard. 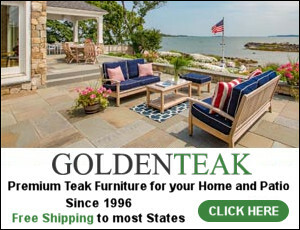 Chairs are Sherril Furniture in a Fabricut fabric. Sofa is Hickory. Coffee table is Noir Furniture. Drapery fabric is by Quadrille. This open space is perfect for entertaining! The kitchen area is functional as it is attractive. The wall paint color is also “Benjamin Moore OC-139 Sea Wind”. Selecting the Main Paint Color: “I selected a light color in the main public spaces that blended with our millwork and also one that allowed the fabrics to take center stage. Paint is always the last thing chosen in a new home and it is very important in most cases to select colors that compliment and not overpower the chosen palette”. – Andrew Howard. Dining chairs are HollyWood at Home. The farmhouse table is from Piedmont Wood Products. The dining room lighting is from Urban Electric. The cabinet paint color is “Benjamin Moore OC-17 White Dove”. 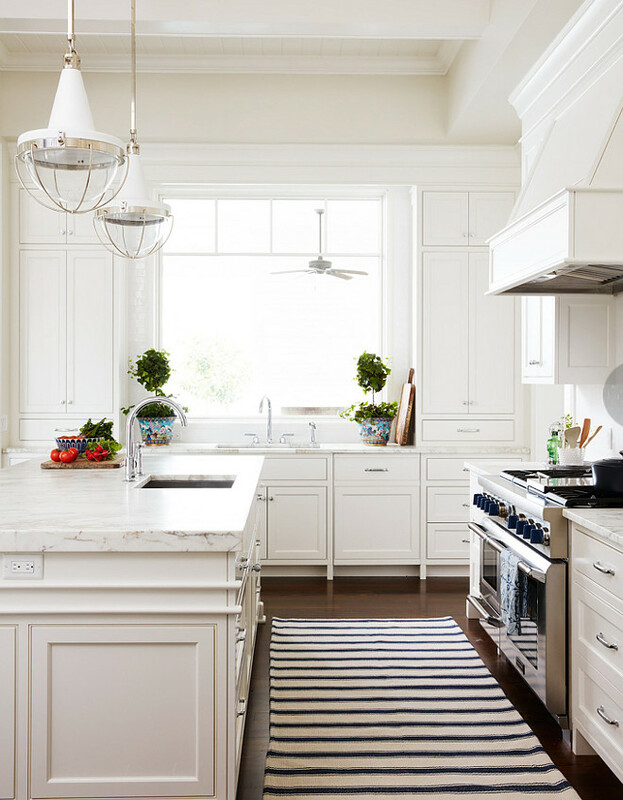 Benjamin Moore White Dove is the best off-white paint color for cabinets, especially if you have darker hardwood floors. Paint color is “Benjamin Moore 2125-50 Sweet Innocence”. Trim paint color Benjamin Moore OC-18 Dove Wing. Rug: “The biggest mistake that can be made by anyone is to order a rug that is too small. A general rule of thumb is to order a rug that all or most of the furniture fits on.” – Andrew Howard. The Bobbin chair is an antique with a Raoul Textiles fabric. The other chair is Lee Industries with a Quadrille fabric. 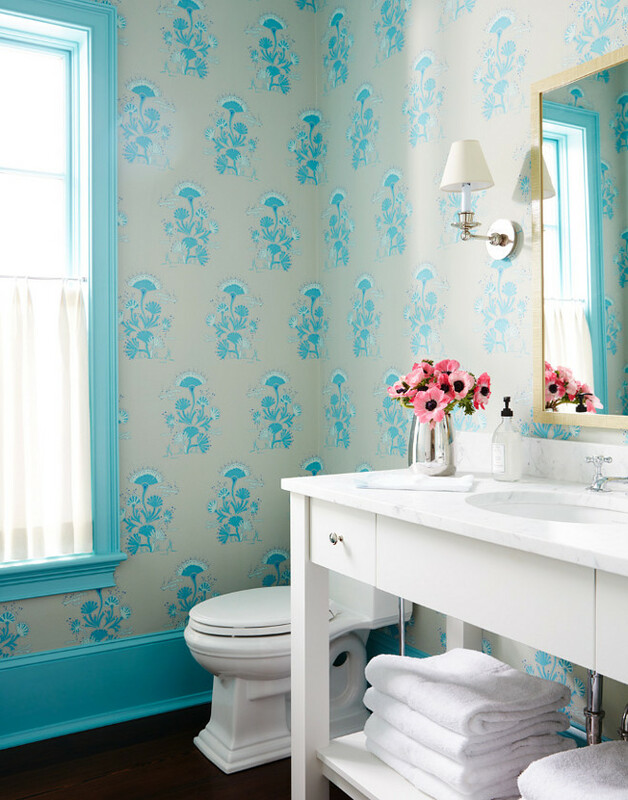 Powder rooms are the perfect space to add personality. Take this space for inspiration! The turquoise trim paint color is “Benjamin Moore 2052-50 Pool Blue”. Choosing the Right Wallpaper: “Pick wallpapers that you love and trust your decorator to make it work. If you don’t have a decorator (you should), but if not then smaller scale patterns work better in larger rooms and bigger scale things work great in smaller rooms. I like pulling a trim color from the paper and not doing white trim in a lot of cases. I think it adds an extra level of detail.” – Andrew Howard. The turquoise wallpaper is by Holland & Sherry. The second level living room is where the family go to spend some quiet time and watch their favorite tv shows, so comfortable furnishings was a must. Mixing Wood Finishes: “I never want things to feel like a set. There is nothing a designer dislikes more than someone wanting to reuse a bedroom set they bought off the floor of some furniture store when they graduated college and all the woods match and styles are the same. I like things to feel collected. 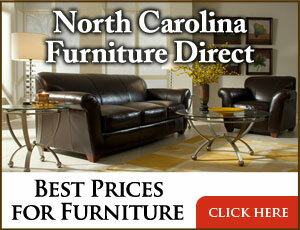 I dislike when all the woods in a room match, or furniture is in all the same fabrics.” – Andrew Howard. Sectional is Lee Industries. Coffee table is Palecek. 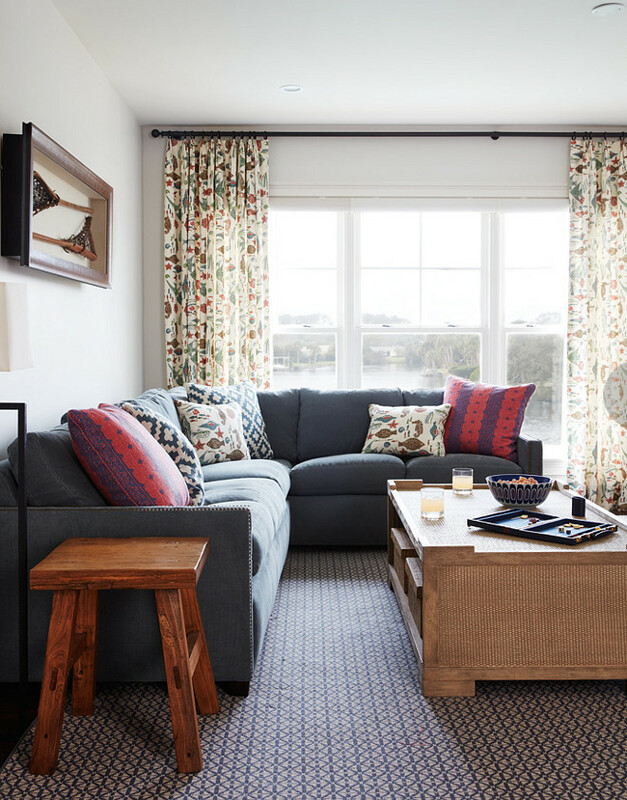 Curtains feature a Peter Dunham fabric and the area rug is by Stark. 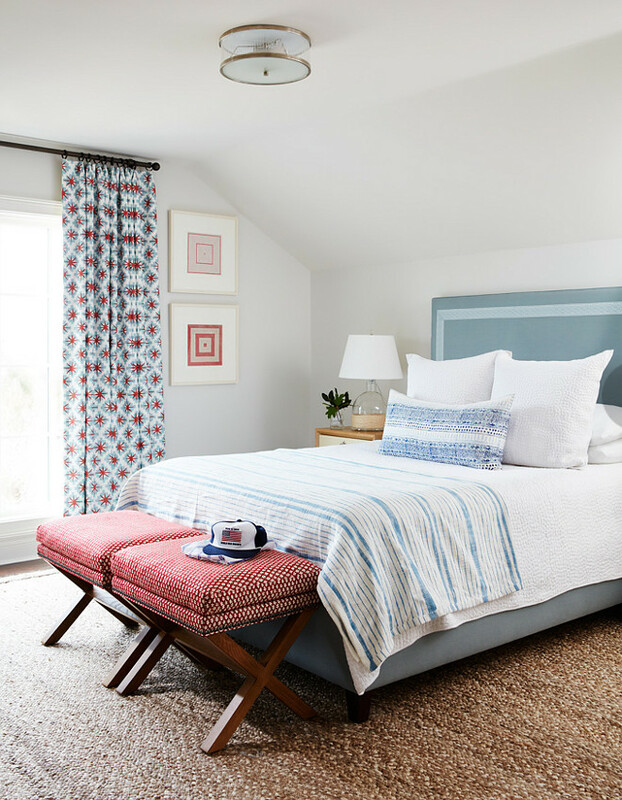 A neutral wall color serve as canvas for some exciting fabric and textures in this guest bedroom. Paint color is “Benjamin Moore 857 Sheep’s Wool”. Bedding is John Robshaw and bedside tables are Bungalow 5. Flushmount light is from Circa Lighting. Bed is custom. Benches are Lee Industries with a Sister Parish fabric. Rug is FiberWorks. 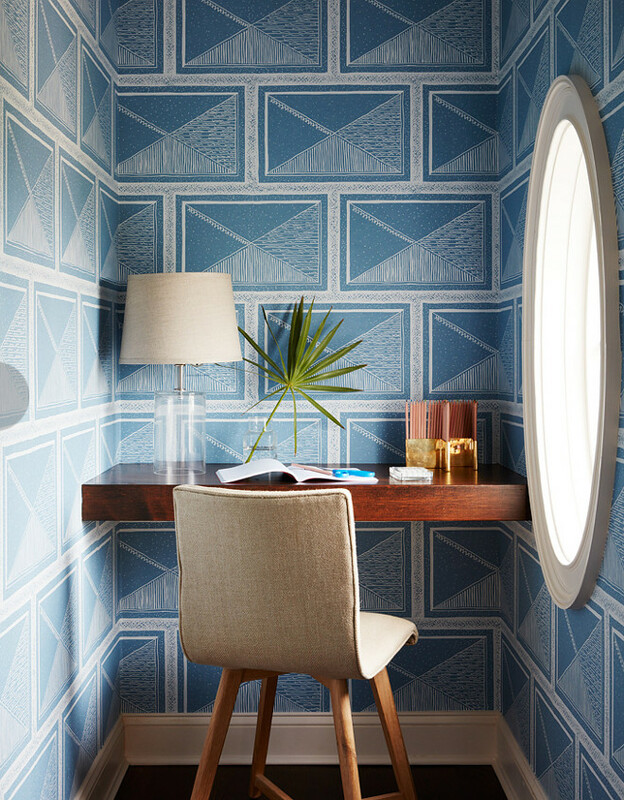 This nook features a built-in desk and a blue and white geometric wallpaper. I love this cozy space! 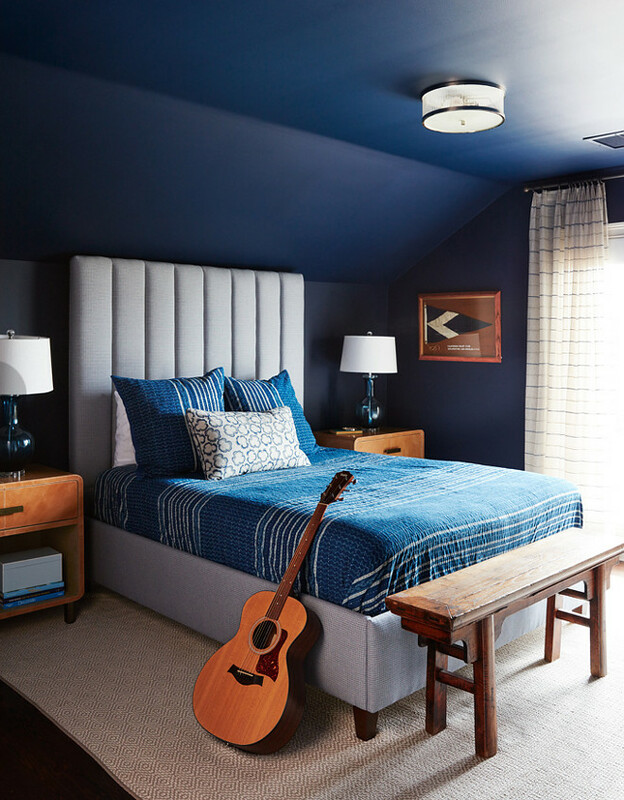 This navy bedroom is handsome and intriguing. 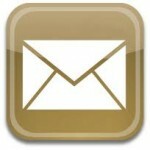 The navy paint color is “Benjamin Moore 2061-10 Deep Royal”. Using Dark Colors: “I try and use shades that reflect the amount of natural light the room gets. People always think a normally dark room should be painted a light color to lighten it up. I actually think the opposite is true. A dark room painted a light color will always feel sterile and something will not feel right about it. I like to embrace the darkness and make it feel cozy with a darker color. The same is true for a light filled space. Embrace the light with a lighter color that allows the light to bounce around the room.” – Andrew Howard. Bedding is Pine Cone Hill. Nightstands are from Made Goods. Curtains are Romo and rug is Dash & Albert. I love how coastal and classic this bedroom feels. The alcove beds are so cozy and inviting! Bedding is John Robshaw and the rug is Dash & Albert. Pale Grey Paint Color: “Benjamin Moore 962 Gray Mist”. Notice the beautiful view! Lounge chair is by Sherrill Furniture. Fabric is Romo. The draperies fabric is Peter Fasano. Rug is Stark and bedding is Matouk. 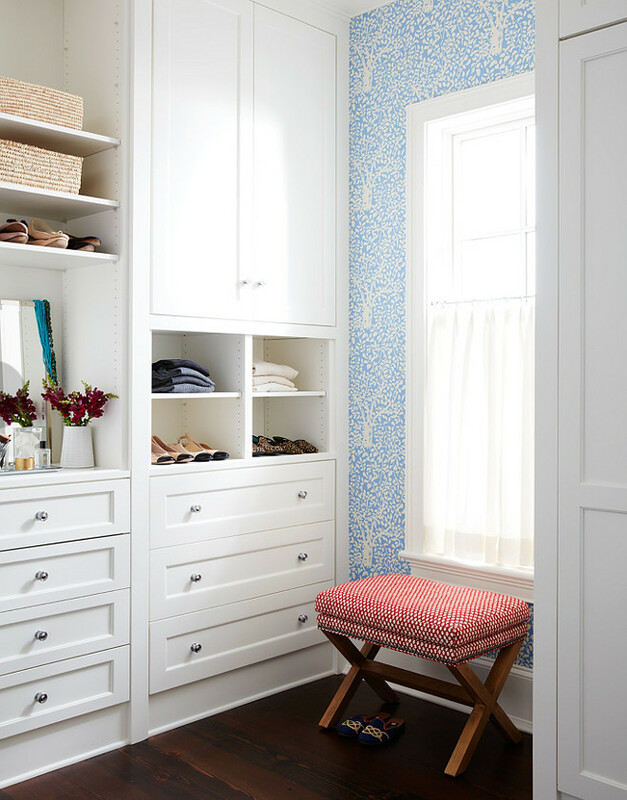 The closet built-ins are painted in “Benjamin Moore OC-17 White Dove”. Cafe curtains are by Romo. 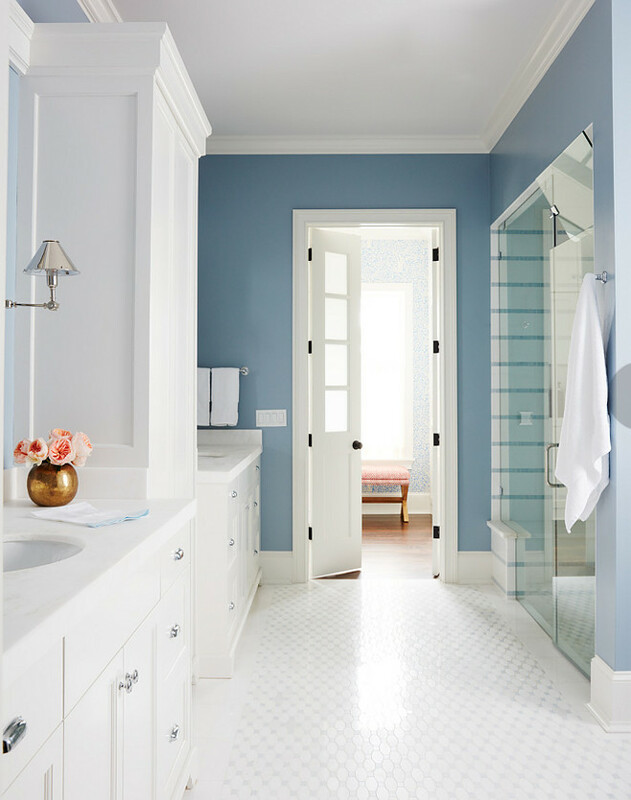 I love how clean and calm this blue and white bathroom feels. The bathroom is not huge but the designer worked very well with the square footage of this space. Tiles are from New Ravenna. Sconces are by Circa Lighting. This inviting patio features painted outdoor brick fireplace and outdoor furniture with turquoise fabric. Dreamy! Colors: “The outdoor is so colorful and fresh I actually tried to tie my fabric choices to it and not try and necessarily match something inside the house. 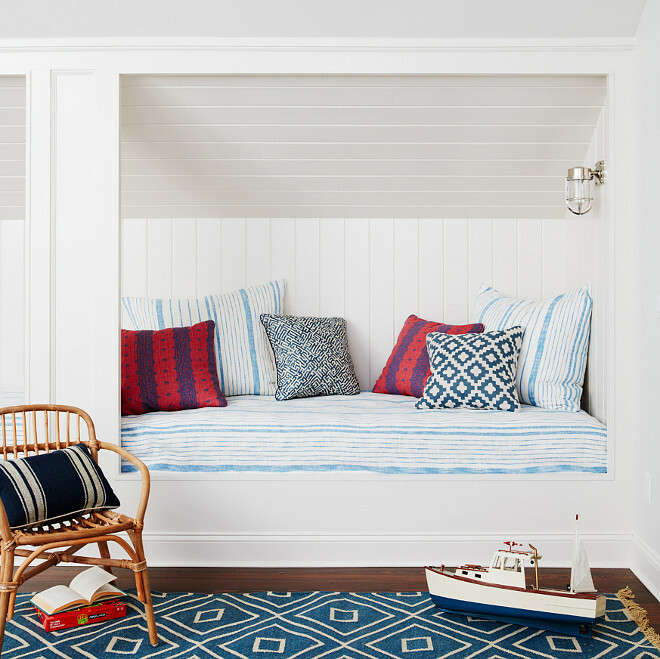 I wanted the outdoor fabrics to blend with the environment they were in.” – Andrew Howard. This outdoor area features comfortable dining furniture and durable stone floor tiles. The painted brick exterior paint color is similar to “Benjamin Moore OC-18 Dove Wing”. Go Green: “Greenery or flowers don’t have to match your décor. Find something you like and put it in a great container and it will instantly bring a room to life.” – Andrew Howard. The exterior features painted brick and shingles. The blue-gray shutter and front door paint color is “Benjamin Moore HC-169 Coventry Gray”. Thank you for being here today, my friends. May you have a day filled with Light & Blessings! Sources: Andrew Howard Interior Design. What a stunner–I love all the blues! Andrew Howard can do no wrong in my book, he’s one of my favorites too!